The BMP-1 is a Rank V Russian light tank with a battle rating of 7.3 (AB/RB/SB). 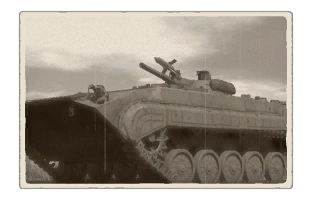 This vehicle was introduced in Update 1.71 "New E.R.A.". Shoot and scoot. Alone, exposed BMP-1 is a dead one. Use your mobility to find reasonable sniping spots (for your ATGM) and only use your cannon if an enemy is close and unaware of your presence. Remember that if ANYTHING sees you, it can kill you, even a .50 cal from an American tank can devastate you. Suspension wheels and tracks are 10 mm thick. Belly armour is 6 mm thick. 40 7 N/A N/A ? The BMP-1 comes equipped with a coaxial 7.62 mm PKT machine gun. The most distinctive features of the BMP-1 is its shape, cannon and ATGM system. The BMP-1 is just a giant box (barn) and is relatively easy to hit, even from long distances. This vehicle utilises a small crew of three (no commander), but is very spacious, so shots from the side are likely only to damage or destroy one module at a time. 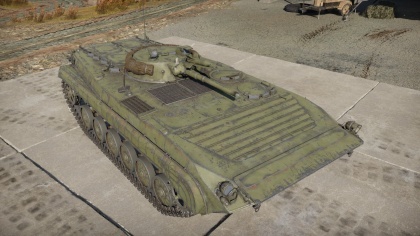 However, with only 23 mm AT MOST protecting the tank, you can bet hull breaks will be plentiful, especially when facing enemies equipped with APFSDS. Unlike most vehicles, the BMP-1 is equipped with a short-barreled 73 mm gun (an odd calibre) firing exclusively anti-tank grenades. While the drop is extreme (though not worse than a German howitzer) it can be used to great effect at lower (or similar) tiers due to the penetration at any distance is 300 mm. The standard PG-9 ammunition has an explosive mass of about 1.25 kg. The trade-off, in this case, is the low velocity and relatively poor slope characteristics (the penetration drop in half if more than 60 degrees of slope). Finally, as standard, the BMP-1 is equipped with the 9M14 ATGM, capable of penetrating 400mm and carrying an explosive mass of 2.6 kg. It is WASD guided, and therefore somewhat tricky to use at first (and especially difficult to use in high packet-loss or high ping matches). An optional modification for the BMP-1 allows it to use turret-mounted smoke grenades as well as a next-generation missile, the 9M113. The BMP-1 (as of 1.77.2.149) is the earliest vehicle in-game to be able to use a SACLOS (mouse-guided) system for an ATGM. Not only is the missile nearly twice as fast as the 9M14, but it carries a slightly larger explosive payload, and can penetrate up to 600 mm at 90 degrees, at any range.